Today, our interactions with the digital world have surpassed the human interactions so much that the need for the user interface to be appealing and friendly plays an important role in terms of progression. Government websites are no different. The first connection which they have with their citizens is more likely to be an engaging website. One of the most essential tools for meeting the needs of your people or citizens. So, it has to be the best. Right? Creating a functional website with easy navigation not only help officials do better in connecting with their constitutes but also ensures that the public stays well informed all the time. Drupal is one such platform which helps you achieve all of this in one go. How is Drupal in Government sector performing? Drupal has an excellent track record when it comes to solving and maintaining security issues. The security team (Drupal Community) that works together with other councils watches and ensures that its users are getting the best security practices. Login Security: Drupal sites that are available in both, HTTP and HTTPs provides the user with a lockdown in the login page, and submits the other forms securely via HTTPS. Hence, it prevents passwords and other sensitive user data from being transmitted. Password Policy: This module forces a user to forcefully create a strong and powerful password. Captcha: It is the response test which is specifically constructed for determining the user. To check whether the process is being done by a human and not by a robot. Security Kit: It provides Drupal users with various security hardening options. This doesn’t let the website compromise the data and information to the hackers and other foreign users. Security Kit presents particular mitigation for cross-site request forgery, cross-site scripting, and clickjacking, among other issues. Two-factor verification: The two-step verification is a procedure that implicates the two-step authentication method, which is performed one after another to verify the requesting access. Government websites are those kinds which are used by everyone, and by everyone, I mean the visually impaired too. Each citizen should be able to access the government website quickly and seamlessly and according to WACG 2.0 (web content accessibility guidelines), every website should provide equal standards to all the people. Drupal is one such platform which adheres to each and every WACG guidelines with its different modules and provides accessibility to everyone. Alt text: This is one of the most important modules when it comes to providing accessibility to a website. With this module, the search engine understands the text of an image or a page and screen readers read it loudly to the user. Content accessibility: This module checks all the type of fields where the user can enter formatting. Below the content section of the accessibility page, the user is provided with the option to turn the tests on or off using the tab that would appear below the page. Accessibility in WYSIWYG: This type of module integrates the accessibility configuration with the WYSIWYG or CKEditor modules, which provide the user with a new button while they are editing the content that checks the work for accessibility issue. The government budget for software developments cannot be compared to the budget of large enterprises for the same purpose. The government needs to opt for a high-quality solution that does not cost a fortune. High development and maintenance costs may be considered as an obstacle to finding high-quality website solutions. Thus, Drupal meets these and many other requirements are the reason why the government chose it as there CMS. The Drupal development price is relatively low when it is compared with other CMS in the market. Another great feature of Drupal8 is its perfect scalability. The CMS is suitable for both small survey website as well as the content-rich websites with gigabyte information. At the same time, Drupal is capable of handling high traffic issues and problems. Web solution built on this tool is available even when the traffic volume jumps sky high. A great example of the same is UNESCO and CERN web channels. These Drupal-based websites offer a great user experience and thousands of people use it on daily basis. When we say government websites we automatically imagine something grey, black, white or something really boring. But one has to remember that these website services both political and non- political purposes. Thus, user interaction and engagement then here becomes a crucial aspect. 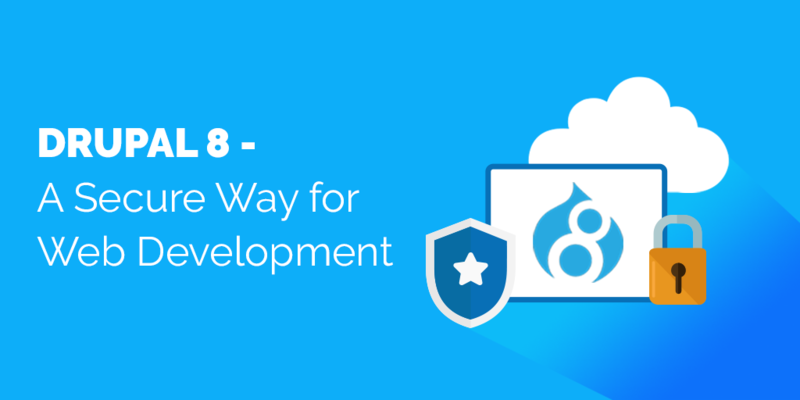 Better user engagement is made possible with Drupal and its modules. The administrator can add blogs, articles, write-ups that contributes highly opportunities and solutions. Not only this but Drupal also gives its user the power to personalize their website according to their needs and requirement, making it a flexible and reliable CMS. A powerful web solution should integrate seamlessly with third-party applications. 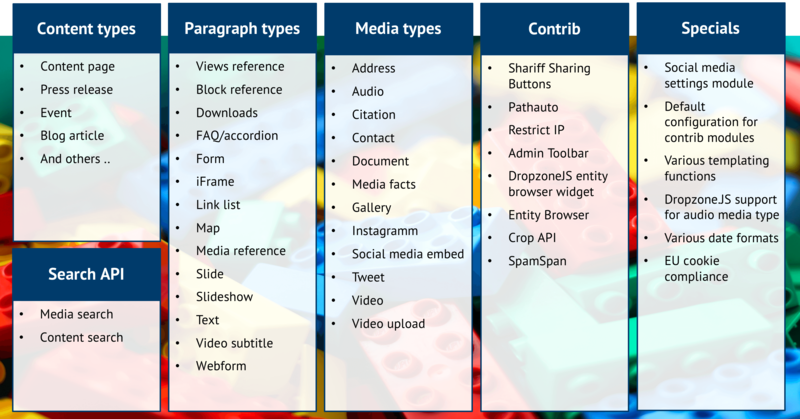 Publishing tools, data repository, and other features belong to the list of necessary interactions. The integration capabilities offered by Drupal is enormous. It provides numerous options so that the user is able to integrate any type of third party service. 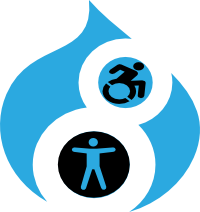 DeGov is the first Drupal 8 open source distribution focussing entirely on the needs of the governmental organizations. It is intended to provide a comprehensive set of functionalities that are commonly used only of the applications that are related to government. The DeGov distribution is not a commercial CMS ( developed as well as owned by a single company, and the users usually need to buy a license) and it is not a finalized product. Meaning, DeGov is not a ready solution. The reason is that there are a lot of functionalities and ideas in backlog and hence it is a daily work off process. DeGov is an idea to realize the benefits in the public sector with the idea of open source. DeGov has 6 use cases and extends its valuable functions to meet certain scenarios. Publishes information for all the websites that are government based organizations of all level. Service-oriented E-government portals, that closes the gaps between the users/ citizens and administrator. Citizen engagement portals to decline and discuss online. Open311 portal for civic issue tracking. Intranet and Extranet of government employees. DeGov is the sub-profile of the lightning distribution. Lightning allows you to create sub-profiles that are entirely based on default lightening distribution profile. Creating a sub-profile enables you to customize the installation process to meet specific needs and requirements. By combining DeGov and lightening distribution, it delivers configuration that is specialized to start new projects. Building on top of Lightning, DeGov leverages in a true open source manner that allows focussing on functionalities for the public sector. Which problems does DeGov solve? DeGov solves the issues that are all related to complex backends, missing workflow, multi-language as a pain, missing modernity etc. It allows the editors with highest design flexibility in the maintenance of the website as well as simple editing of the content. DeGov distribution also helps in easy integrating of the social media. Likewise, you can allow the users to easily share the content in form of articles, blogs, and other write-ups. DeGov uses the privacy- compliant integration of social media share buttons. DeGov solves the issues that are related to the features and high ownership with old and propriety technologies. It a user-friendly web front with attractive designs. It is responsive and thus adapts to any device and its size. The use of HTML/CSS makes a website accessible. Likewise, the page can be made translated into several languages. A language switcher and an automatic screen reader translate the workflow easily. DeGov websites receive a powerful search function for the website content as well as the documents. This is particularly convenient for the authorities: The administrator search engine and NRW that is connected to the service so that users can also search the content outside their area of responsibility. It solves the issue related to high-cost updates and the functionalities that are related to it. The distribution is based on opensource software, as a result, you pay neither for the license nor you purchase it. Drupal is used in numerous projects thus the basic functions and the functionalities are constantly updated and expanded from time to time. This fixes all the bugs and vulnerabilities quickly. 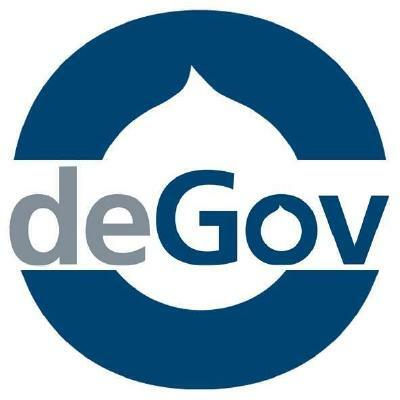 The DeGov distribution has the ability to release, federal and state portals, as well as internet sites for ministries, authorities, districts, and municipalities. The web pages and the target group-specific portals (or topic pages) can be created easily by DeGov. 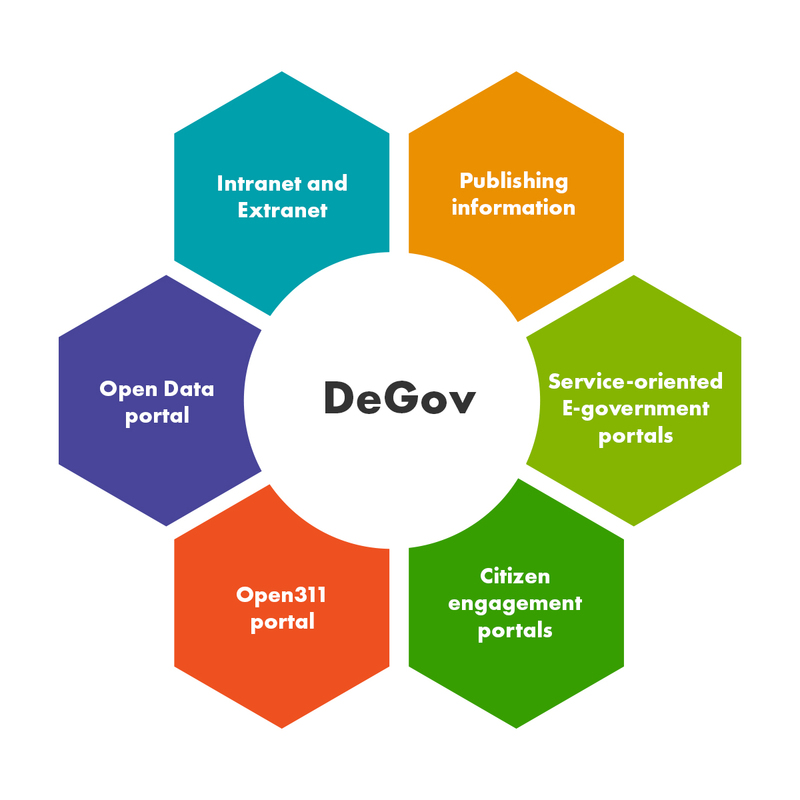 With participation portals to let the citizens participate in decisions and proposed measures, DeGov distribution has opened doors in terms of communication. Here you can notify, discuss with users, gather valuable suggestions or create polls. From participatory budgeting through bills to constructing methods - portals obtained by DeGov give citizens as a voice. 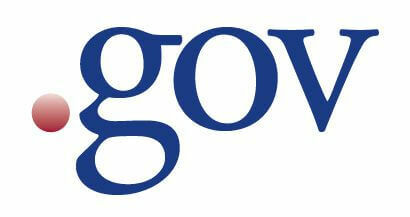 DeGov distribution is a great way to implement entire eGovernment portals. Less stress is laid on the editorial content than whole specialist procedures. In this way, DeGov allows the digital processing of administrative processes. The project Gewerbe.NRW was implemented with the help of DeGov distribution. Why DeGov with Drupal 8? It is based on Symfony and it uses composers. It is Git accessible for config files. The new "Gewerbe-Service-Portal.NRW" has been providing citizen friendly services by allowing company founder in German federal state North Rhine-Westphalia (NRW) to electorally register a business from home. Its main aim was to provide aid of a clearly arranged online form, commercial registration and that can be transmitted to responsible citizens. In addition to the business registration, the portal provided with information to the topic “foundation of an enterprise”. Furthermost all the users had access to Einheitliche Ansprechpartner NRW. Also, the online service supported specialized staff in taking up a service occupation. The portal aimed at providing more flexibility to the entrepreneur that is eligible to start there own business by saving time through digitization. The electronic forwarding and processing of the application by authorities ensured effective processing within applications. The result was effective and user-friendly communication between the citizens and authorities. Whereas in the near future the Gewerbe-Service-Portal.NRW will develop a comprehensive service platform so that the administrative process could be carried out at home. So how important is the government website to you? The answer might have been crystal clear by now. As important as it is to have a website, maintaining it a whole different task. Yes, Drupal is making it easy for you by its functionality and distribution. But the definite art of maintaining it is as important as creating it. Ping us on [email protected] our services would not only get the best out of Drupal but would also but would also help in enhancing your development and industrial standards.